Care should be taken when using this asset, as its flimsy armor means that it operates more like an oversized light mech rather than a workhorse medium, a fact mirrored in its cheap cbill and ticket cost. The Chimera Prime is a medium range skirmisher. It's biggest gun is its torso mounted MRM20, accompanied by a single ERLBL reaching out to 800m and a pair of ERMBL that come into play at 600m, roughly the edge of its missile launcher's sweet spot. Jump Jets allow the Prime to pop out of cover and unleash an alpha strike, preferably against larger, slower targets that are more likely to take the MRM launcher's full salvo, but its single DHS means that a cooling period must follow each strike, as all of the variant's weapons generate a good deal of heat. A single Machine Gun provides some extra defence against Battle Armor. Being unable to afford any extra tons for MRM ammo, pilots should keep an eye on their reserves, as running dry means that its firepower will be significantly gimped. The Chimera A is a pretty straightforward long range fire support unit. Its main firepower comes in the form of an indirect LRM15 launcher fed by a single free ton and a direct fire ERPPC capable of deactivating enemy NARC beacons, but liable to accidentally doing the same to friendly ones, condemning the variant to working at half capacity against NARCed targets. Backing those up against enemies that close with 500m is a pair of MBL. Not being able to afford the extended range models means that the sweet spot between all guns firing and its missile launcher's minimum range is even smaller, and pilots are better off outright avoiding close range engagements, using their backup lasers' range as a cue to break off and increase the distance. Its sole DHS struggles to manage the heat generated by continuous fire. One mans sheep is the other mans wolf. This unit is the sole embodiment of that principle. While short ranged and of limited staying power when pitted against opponents above it's weight class, this marvel excels in bullying targets under it's weight class in close quarter combat - the stray Battle Armors that are left or just spawned to defend a base or choke point. Not only bullying, but actually shutting down smaller units and stripping them of many of their inherent advantages: dumbfiring the almighty DSSRM6 provides a wide area of splash damage, each of the LPPC jolts will instantly suppress the BA's targeting systems even if by the mere splash, if not outright finish it off on a lucky hit. The Improved Jump Jets will augment it's mobility to rival if not surpass that of an Longinus Battle armor. The quad Machine guns array will keep the BAs regeneration functions in lock down while whittling it's armor even further down, even for a tiny bit. The units foremost flaw is the DSSRM6 launchers hunger for ammo - after vomiting out only six (6!) volleys it will run dry and depend on the spare reload - be it bought or not. The selling point for this unit is its incredible brawling potential against smaller and extremely mobile opponents. A mid range skirmisher similar to the Prime, the Chimera C sacrifices its jumpjets for increased damage potential. Upgrading its MRM launcher to a 30 and swapping its hitscan Large Laser for a splash capable PPC, the C packs a meaner alpha at medium range, but increases the pilot's need to lead their aim and gives them a harder time against small targets. 4 SBL and the MRM launcher's short minimum range mean that despite not usually being the one to enter close combat, it's more likely to be the one to leave it, but at the same time it has a hard time bringing out its full firepower without being cornered. A single DHS necessitates avoiding prolonged engagements and no free tons for its missile launcher will leave it dry after just over a minute of continuous fire. 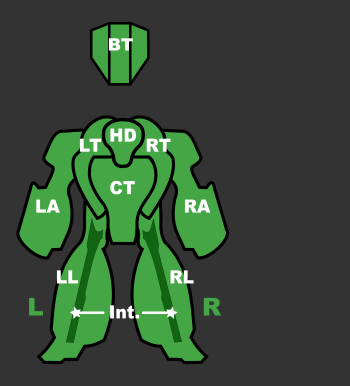 Features a omnidirectional firing B-Pod should enemy Battle Armor get too close. A straightforward ultra-long range fire support unit. Equipped with a Light Gauss Rifle and ELRM15 launcher, the Chimera D works best perched on a hill outside the range of most return fire and harassing enemies kept at bay by its allies. Two free tons give each of the weapons an extension to their operating time and a pair of Machine Guns offer some protection against BA and extra ultra-long range harassment. The nature of its weapons allows it to attack the air as competently as the ground, but having half a ton stripped off the Chimera's already weak armor means distance is its defence, and it's unlikely to survive any kind of retaliation, attack runs included. Like most ultra-long range assets its damage isn't overly impressive, while its missile launcher necessitates running active, making spotting it a trifle for flanking enemies. Despite lacking any heatsinks outside of its reactor whatsoever, it doesn't generate significant heat either. 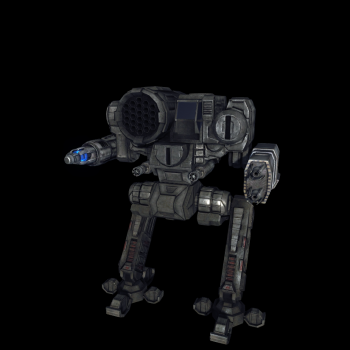 A middle Armored and priced Chimera, it is the long ranged sniper variant. Reaching out to your enemy with 2x LBX5 and 1x TBolt5 aided by EOptics. JumpJets give it some much needed sniper mobility. Two Extended Range Medium Beam Lasers protect it against Battle Armor or finishing off wounded opponents. When piloting this Mech stay With but Behind your unit to provide them with cover fire. The cheapest of its variants, Chimera F is a close range skirmisher and brawler, combining mid and close range weapons. Within 600m the F opens up with an explosive round firing AC10 and a pair of always reliable ERMBL, giving it the ability to harass opponents while looking for an opportune moment to enter into close combat. At close range a pair of ERSBL strengthens its pinpoint strike, quickly followed by a SRM6 launcher, providing a one-two punch of explosive weapons with screen shake and splash damage, followed by a pinpoint energy strike. One free ton for ammo is usually reserved for the more ammo-hungry missile launcher, while a complete lack of extra heatsinks limits the unit's effectiveness to hit and fade tactics and short engagements. The Chimera G is a bit of an awkward NARC carrier. Equipped with a iNARC launcher, it has to get within 800m of its targets, almost into medium range, in order to successfully plant a NARC beacon. Unfortunately, it doesn't have any of the supporting equipment these units usually come with, so it's more suited to mingling with skirmishers or approaching brawlers rather than being relied upon to designate targets in long range stand-offs. Its secondary defense is a ERMBL duo usable for up to 600m away, allowing for a quite tight band gap of 350m up to 460m where all of its weapons are effective to the maximal amount. Although the LRM20 will fuse the missiles from 100m out, the lobe of the launcher would rarely allow a reliable hit closer than 350m straight on. alternatively, the pilot might plant an NARC beacon from closer up (even passive) and engage the target while running away - by enabling the radar first and firing the mighty LRM20 without a lock on - they will home on the unfortunate bearer of the planted NARC beacon. One has to be aware thou, that the single ton allotted for ammunition doesn't make the choice NARC or LRM any easier. Be it used for 6 extra NARC shots or 9 LRM20 salvos, either will generate revenue only if used smartly. The units main selling point is it's heavy punch of the far reaching LRM20 launcher, or maybe the ability to plant improved NARC beacons at the price of the 2rd most expensive Chimera variant. Similar to the earlier Gunslinger, the Chimera was designed in the spirit of cooperation between the Combine and the Davion Federated Commonwealth in the lead-up to Operations Bulldog and Serpent. The Chimera is built on a Chameleon Light Endo 2 Endo Steel chassis that carries a GM 240 XL engine which provides the 'Mech with a top speed of 97.2 km/h. 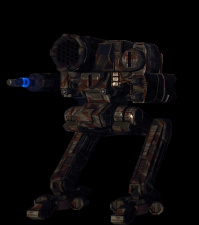 The Chimera's mobility is enhanced by six Rawling 40 jump jets that allow the 'Mech to jump up to one hundred and eighty meters. The Chimera is protected by seven tons of StarGuard CCM armor. This page was last edited on 13 February 2019, at 19:01.